In the Year 1888 , the Empress-Dowager Zsu Hsi , -also known as "Cixi The Dragon Lady" for her ruthlessness & cunning- , let her eye fall on a an Estate nearby. This Estate , which was orinally built for the Emperor Qianlongs' Mother and stradled the grounds of the original Summer Palace the Palace Qianlong had named "Park of Clear Ripples", was converted -At Huge Costs- to the New & Rebuilt "Summer Palace" we know today. These & other practices at the Empires' Court would later lead to Great resentment among the people and to the final downfall of Cixi's favorite : China's Last Emperor Pu Yi. 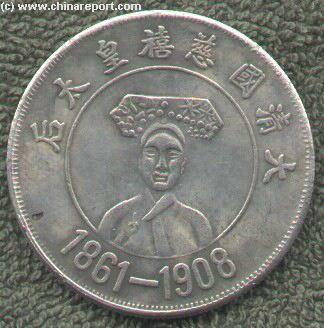 Cixi died in 1908 AD , after which PuYi was crowned Emperor. PuYi , then only 6 years old , was deposed only 3 years later in 1911AD. This effectively ended the Manchu Ching Dynasty. 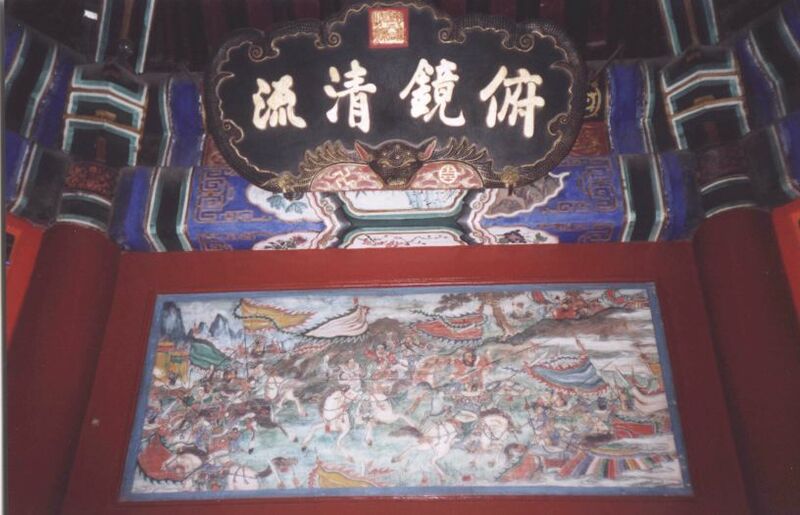 One Famous Story about Cixi and Her Rule is vividly illustrated at the "Summer Palace" , the Palace Complex from where by now Cixi regularly conducted her Governing Business. "Afloat" in one of Canals on the western side of the Palace and with a Nice View of the Kunming Lake is the Qiuyangfang or Marble Boat. A white marble terrace aboard which Cixi used to enjoy her Tea , view the surrounding Lake and her beloved dream the Yihe'Yuan , or Garden of Cultivated Harmony. The funds for this dream were rerouted by Defense Minister Prince Chun under Cixi's orders from the defense budget while china was at war with no less than 10 nations. The Kunming Lake. Largest Man- handdug Lake in the World. Certainly in those days. It covers some 30 square kilometers , which is about 3 quarters of the Entire Summer Palace Area. The original "Summer Palace" as it is now popularly know by Tourists and Foreigners was built by The Ching-Dynasty Emperor Qianlong ( Ruled 1736AD - 1796AD). 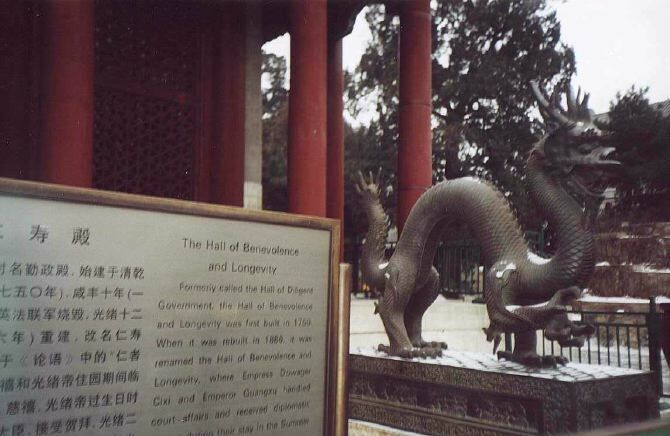 It was located North-Westerly of Beijing and served as the Emperors' Summer Retreat. This first "Summer Palace" enclosed a multitude of buildings and a very large Garden known in chinese as the Yuanmingyuan or Garden of Perfect Purity. the ground in 1850 AD. The YiHe'Yuan, or Garden of Cultivated Harmony has all the Ingredients of a Classical Chinese Garden and much more. Hence its landscape is dominated by Mountains and Water , dotted with buildings, bridges , passageways , stairs and of course the ever present Men or Gates. In fact , entire Summer Palace is the largest Chinese Garden complex in Beijing and probably all of North China. Only the Imperial Summer Retreat at Chengde in Hebei Province can compete with this Grand Scale. the Crane , the Elephant , the Lion, etc. at any Chinese Ming or Ching-Era Palace. 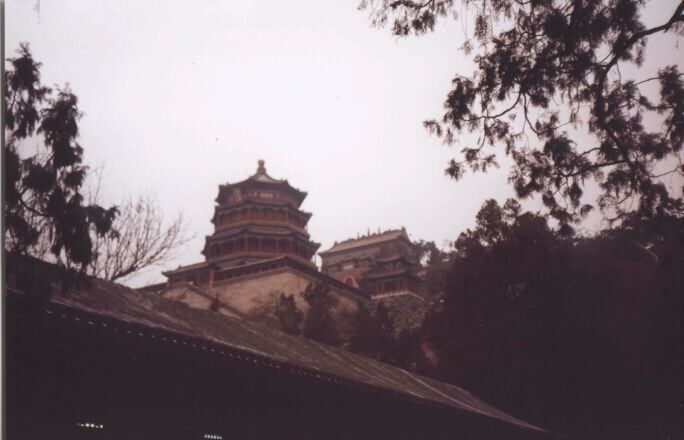 Mountain Pagoda and part of the Empress' private Quarters which were extensive. Part of these Quarters now house a Theater & Opera Museum. Historically it is now known that The Qing Dynastic Court had unwisely spent the money allocated to create a Chinese Navy to try and keep (western / European) invaders out on the Rebuilding of The "Summer Palace" and Cixi's dream of a Garden. According to Aisin-Gioro Pu Yi, China' Last Emperor, it was his father Prince Chung, defense minister, who redirected the Navy money to be spent on the Summer Palace. This he did to stay in the Favor of the All Mighty Cixi for to him this was the one important thing. He feared her notoriously bad temper and blood-thirsty ways. Morover, possibly also he foresaw the possibility that one day his son would become Emperor. At any rate, messing with Cixi could be very deadly, so it was best to stay in her favor. The rumour goes that when the Chinese Admirals complained about only having a shoddy Naval Force , Cixi presented them with this Marble Boat as the "New Chinese Navy". 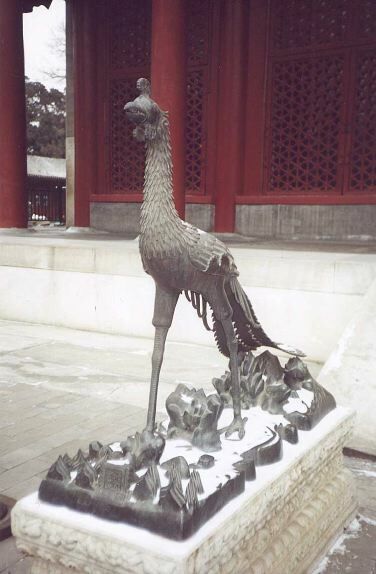 It now enjoys the dubious status of a Chinese monument to incredible stupidity and Irresponsible Government. Not many years later the Chinese Navy was crushingly defeated by a more modern Japanese Flottila opening a way - in due time- for Japan to annex Manchuria and Taiwan. The Mountian Theme in Classical Chinese Gardens is usually achieved by modeling large piles of rock. Often intricate Pagodas are then built on them. A similar but much smaller Mountain-and-Pagoda like this can be found not far away in the Emperors' private Imperial Garden located in the most Northern-most Section of Forbidden City. The Ching Dynasty Era Imperial Mountain retreat at Chengde, North-West of Beijing, is another famous preserved example. 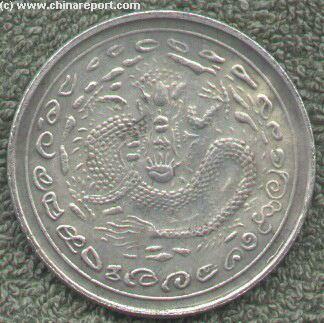 Cixi was a clever , cunning , and dangerous Lady and after Emperor Xianfeng (Hsien Feng) died she managed to get control of the "Dragon Throne" (see Descendancy of Ching House resources page). Guangxu and Cixi soon differed on opinions on which course to take for the Empire. Cixi , -who may have been ruthless and cunning but was certainly not known for her good government- , resented Guangxu's attempts at reform. When Guangxu became 17 and independant as Emperor, he immediatly instituted a National Political Reform Movement. Soon Cixi seized power over him and had The Emperor placed under house arrest , first at YinTai Island at NanHai, another Imperial Garden just west of the Forbidden City, later here at the Summer Palace. It was here at the Palace of Benevolence and Longevity where Cixi and her stooge Emperor Guangxu would hold court, handle court affairs and receive diplomatic emmisaries, as vividly described and portraited in the excellent historic Chinese Film Drama "Reign behind a Curtain". After 1900 the Ching Family, however, again had to relocate, temporarily fleeing The Summer Palace to escape new invading European Forces in the Boxer Rebellion and Wars. The Summer Palace was damaged once more and severely looted. The Imperial Ching Family, Cixi and her court ended up in Xian (Shaanxi Province, N-W China), later returning to Beijing. 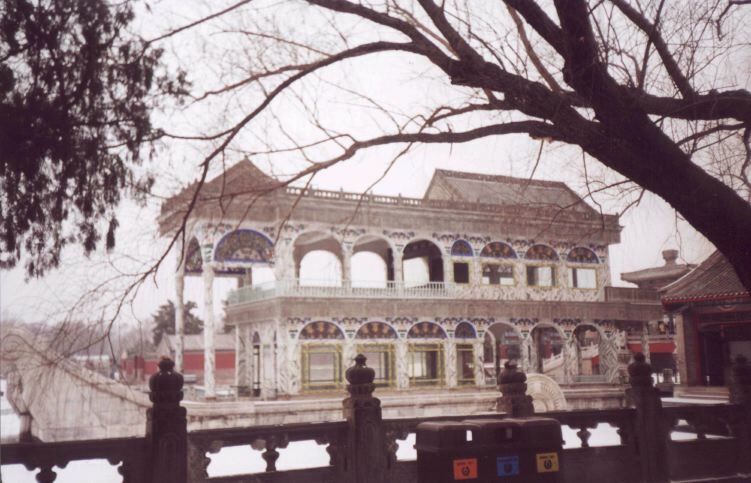 In 1903 AD the Summer Palace was repaired of damage incurred during the "Boxer" Wars. original Palace destroyed in 1850 AD, currently part of Haidian District. This site, very near the western hills with it's fresh water springs, had already been known as a beautiful spot even before the earliest years of the Yuan Dynasty and Dhenghis Khan. Originally named Urn or Jar Hill with Urn or Jar pond at its Base taking names, as is traditional in early china after a local legend (Read "Beijing Legends" or "Sights with Stories in Old Beijing"), in 1153 AD the ruler of the Jin Dynasty had a temporary Palace constructed near the Pond. The Jin Palace was known as Jinshan Temporary Palace. Much later, during the Ming Dynasty (1268 AD-1644 AD) the area was converted into an Imperial Garden, resulting first in the 1st edition of The Summer Palace, an Imperial Garden Palace, and later the second and current edition somewhat to the west, in the same area. The Hall Of Benevolence & Hall Longevity was first built in 1750 AD as part of the Estate the then Emperor Qianlong had let built for his mother. Formerly called the Hall of Dilligent Government , in 1886 AD the Empress Dowager Cixi took control over the Estate and made it part of her new Summer Palace. The Hall was then renamed the RenshouDian or Hall of Benevolence and Longevity. Not much later the Summer Palace became the seat of Governement, as the Ching Dynasty fled European Armies invading Beijing during the 1900 AD Boxer War. Thus it came to be that on this spot that an important part of Chinese History would be played out. rock material excavated from Kunming Lake. the Highest point of it. It is quite a problem to get there , but nevertheless very worthwhile for a tourist visit it. The magnificent Halls at Wanshou Shan are a Palace in tmeselves and played a central role in the religious life and ceremony at the Summer Palace. 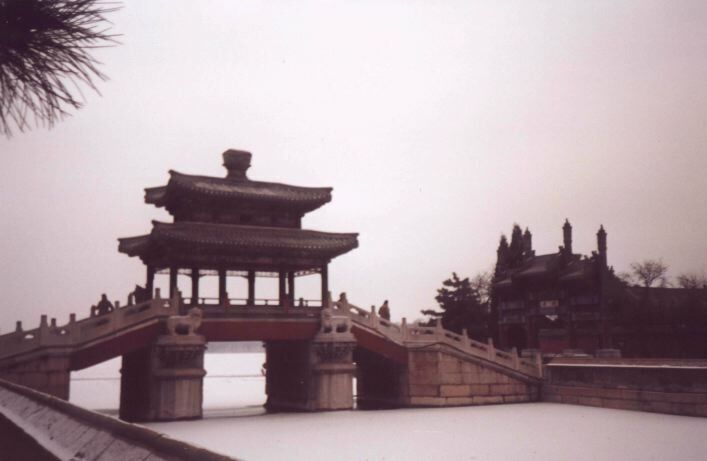 A standard toruist tour does not include these Halls and the Watch-tower overlooking the Entire Summer Palace Park, Kunming Lake and surrounding Gardens. The Changlang runs parallel to the Northern Shore of Kunming Lake and connects the Main Buildings of the Empress' Quarters with eachother. Heading eastward from Kunming Lake towards the Main Gate (Dong Men) we come to the More official buildings of the Summer Palace Complex. Among these The Hall of Benevolence & Longevity. But , .... It is a Beautiful Palace. Among its buildings is the Longest man-made (wooden) corridor in the World. This corridor , the Changlang , is a wooden corridor richly decorated with handpainted scenes from ancient Chinese mythology and of battlefields long forgotten. 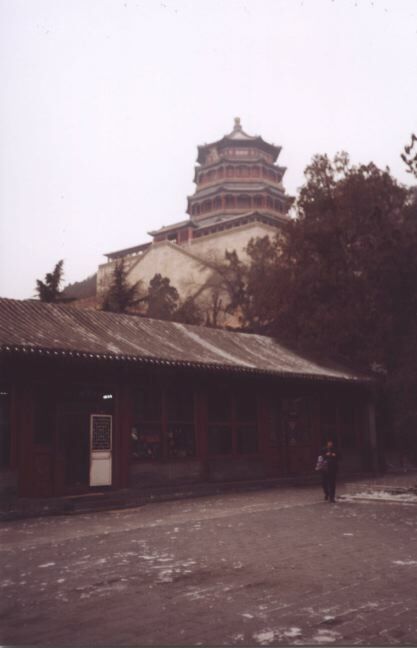 The Tallest Pagoda in the Summer Palace complex is the Pagoda of the Incense of the Buddha. It stands atop Longevity Hill on the North Shore of Kunming Lake. 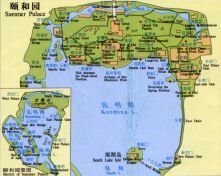 Latest Addition : Summer Palace Museum Park Complete Site Map with all Pavilions, Temples and important Features. 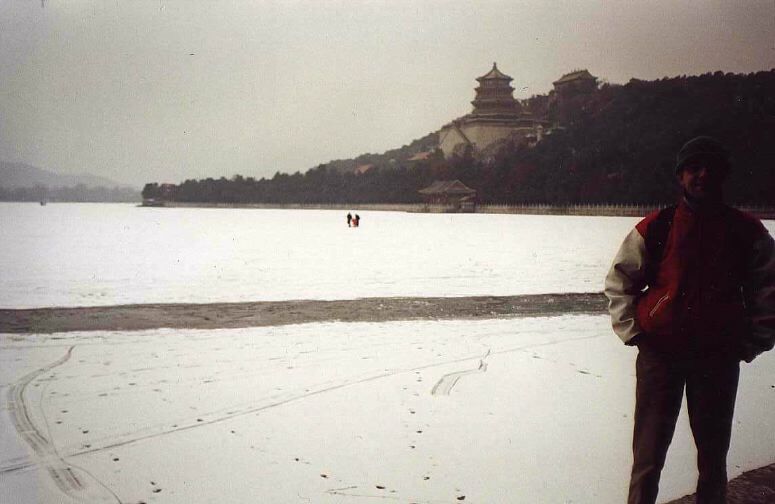 More Reports on the Summer Palace due shortly ! Summer Palace Museum Park Complete Site Map with all Pavilions, Temples and important Features. More information on the Summer Palace added regularly. 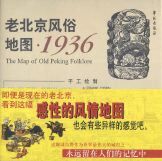 Source Book "Tales of The Forbidden City"
"Tales of The Qing Court"
Source Book "Stories Behind the Summer Palace Long Corridor Paintings"
Source Map "Map of Old Peking Folklore 1936"
Traditional Bridge with wooden PaiLou Gate at the Summer Palace. Source Book "Sights with Stories in Old Beijing"
Longevity Hill earlier known as Jar Hill, one of the main features of Summer Palace Imperial Park. 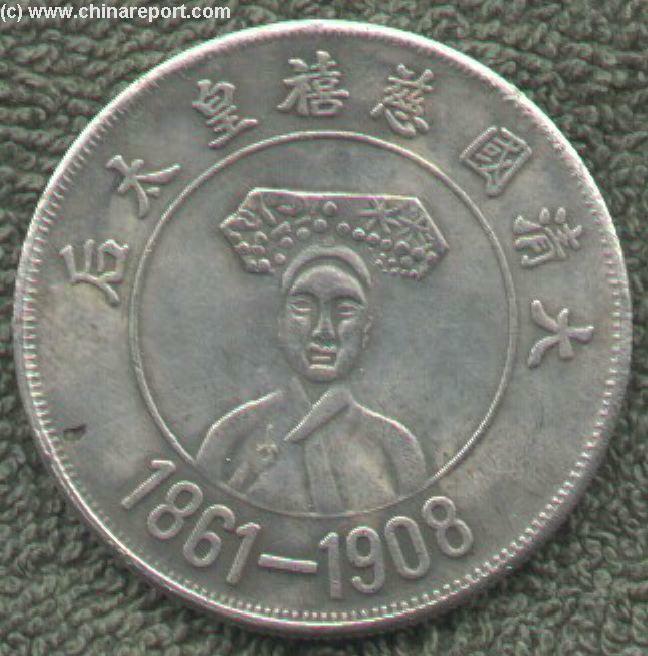 Front of Coin commemorating the Life and Reign of Empress-Dowager Hsu Tzi that ended one day after the Death of Emperor Guanxu. 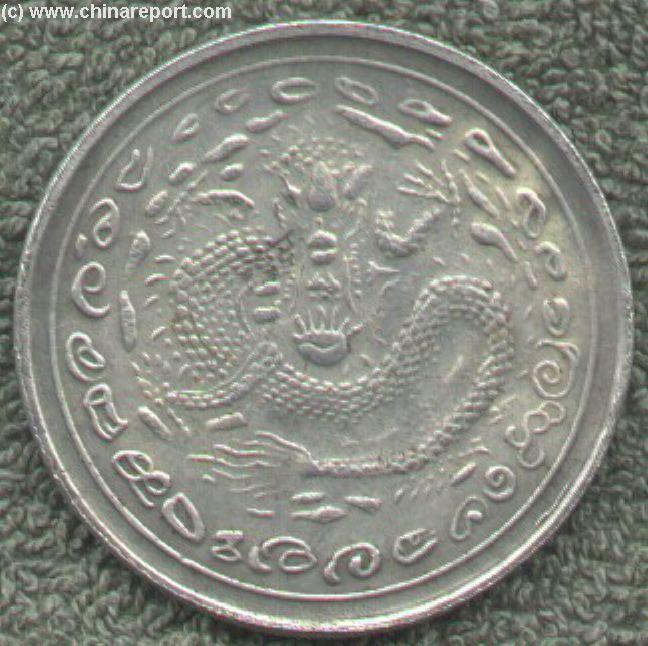 Back of Coin commemorative Coin - the Ching Dynasty Dragon pouncing from Heaven. Many such Pavilions and even some Pagoda's can be found at the Summer Palace , but the Pagoda of the Incense of the Buddha is a jewel and a Palace withing itself, playing a central role in the buddhist rituals going on around the clock at the Summer Palace and in fact all Palaces and even Mausoleums, during the reign of the Ming and Ching Dynasties. Search KLM for available Tickets and Booking - in cooperation with www.drben.net. Soundbonus: Kunming (In anticipation of Winter), Instrumental. A Full Google Earth Supported Map of Summer Palace BJ by Google.com. Adjacent Map gives direct access to the Summer Palace Map by Google.